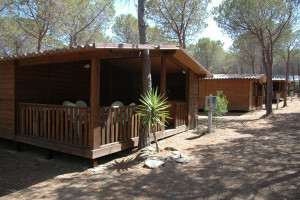 The Calapineta Camping Village is located in a pinewood nearby the sea. 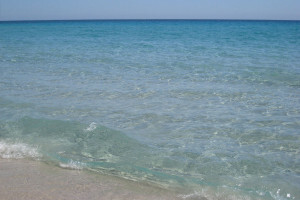 It is about 50 minutes south from Olbia, in Siniscola comune, close to S. Lucia small village. Very close by is the beach known as Capo Comino where fine white sands help create one of the most outstanding natural landscapes that Sardinia has to offer. 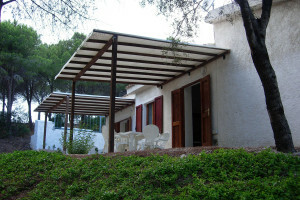 The Calapineta Camping Village offers its guests the choice to stay, beneath the shade of its pinewood, either in wooden or brickwork chalets or, alternatively, in their own camping accommodation (tents, caravans, campervans). The campsite offers four shower/toilet blocks. All of them provide hot water showers (no tokens required). • The swimming pool area comprises three pools: one for adults and two for children. The pools are surrounded by a relaxation area, partly in the sun and partly shaded by the Mediterranean pines. A Jacuzzi pool is also available (paid for separately). • Just by the campsite’s main square is a children’s play area where young children can enjoy themselves in freedom. • Right on the campsite’s main square is a bar, the ideal place for guests to have breakfast or enjoy a relaxing drink in the evening. The bar offers a large outdoor area with comfortable armchairs – the perfect place to sit and chat. 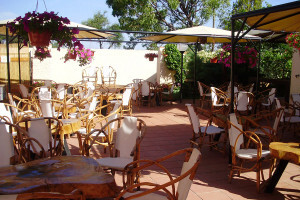 • Also facing onto the campsite’s main square is a friendly Pizzeria with a large indoor dining room as well as an outdoor area where guests may also sample some traditional Sardinian specialties. • Light entertainment is laid on throughout July and August with special attention being paid to the Kids’ Club and sport tournaments. • The campsite offers its own tennis court/five-a-side football pitch. Should guests require them, footballs, racquets and tennis balls are available. Sailing School: If you’re looking for an activity holiday where you can learn to sail or even perfect your style, Sardinia is just the place for you: a paradise for sailing, both if you’re a beginner or a more experienced sailboater. Calapineta in collaboration with the Amfibie Treks Sailing School offers individual or group lessons in centerboard or catamaran sailing and windsurfing. Lessons are run from the beach at Santa Lucia. A south-easterly wind blows almost daily in the Santa Lucia bay, 2-3 Beaufort in the morning and 4-5 Beaufort in the afternoon. 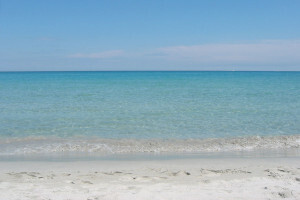 The sea is generally calm in the summer months, providing the perfect weather conditions for beginners. Calapineta Camping Village is in Nuoro province, the true heart of Sardinia. • Boat tours from La Caletta harbour to Golfo di Orosei and particularly to Grotte del Bue Marino, Cala Luna and Cala Goloritzè (Cala Gonone). • The beach just in front of the campsite is known as The Confetti, or “sugared almond” beach since it is not sandy but covered with tiny pebbles, and these have given the beach its name. The water is crystal clear and the seabed is rich in sealife. A dense pinewood, the same one extending from the campsite, surrounds the beach. • Capo Comino: Without doubt one of the most stunning beaches in the entire area. Also known as Le Dune “the Dunes” thanks to its spectacular sand dunes, the beach is very close to Calapineta Camping Village and is within easy cycling distance. Its most distinctive feature is the Capo Comino lighthouse, from where visitors may gain an outstanding view of the whole beach. • Biderosa: Visitors come upon the beach suddenly after following a dirt track for about 4 km, when Biderosa beach unexpectedly opens up before them framed with juniper, cork and ilex trees. The Oasis of Biderosa is a true haven, one of the very few areas in Sardinia with restricted visitor numbers, with its emerald green waters and fine, pure white sands. A part of this area is the Oasis of Biderosa, five dream-like beaches/oases within a wooded coastal parkland covering 1,086 hectares covered by a spectacular pinewood. The park is protected by the Forestry Commission and is situated along state road SS125. • S. Lucia/La Caletta: This thin stretch of sand links the two residential areas. Close to S. Lucia is the base from where the sailing courses are run, offered by Calapineta/Amfibietreks. It is within easy walking distance from Calapineta Camping Village, following a dirt track which runs along the coast and takes about 20 minutes to walk. • Posada: Not far from Calapineta and the residential area of Posada is a long stretch of cream-coloured sand. 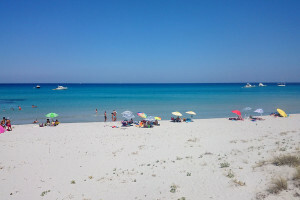 The beach at Posada was nominated Best Beach in Italy in 2013 and was awarded 5 sails by Legambiente (Italian League for the Environment) and the Touring Club. • La Cinta: Undoubtedly one of the most famous beaches on the entire island, spanning more than 10 km and renowned for its breath-taking scenery. In front of the beach lies the majestic island of Tavolara and the smaller Molara where ruins of a medieval castle are found.